There are times when the photo shoot locations are unavailable. Please confirm the details when you enquire. *This image is a representation. 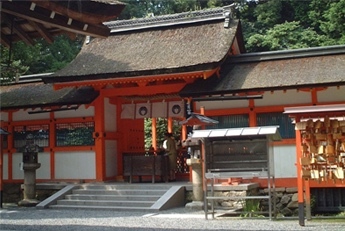 Although the formal name of the shrine is “Toyokuni-jinja Shrine” the people of Kyoto have affectionately named it “Hōkokusan”. 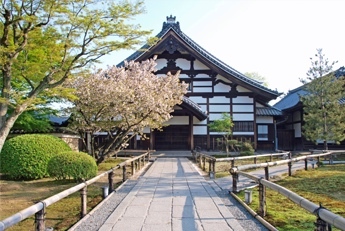 Joined in a marriage of love, which was rare at the time, Hideyoshi Toyotomi and Kitano Mandokoro-nene, who were said to have had good marital relations, are also enshrined here. Furthermore, Toyotomi Hideyoshi, who unified the country, is well known as the god associated with success and good fortune. The Chinese-style gate on the approach to the shrine is a magnificent relic from the ruins of Fushimi Castle and has been designated as a national treasure. 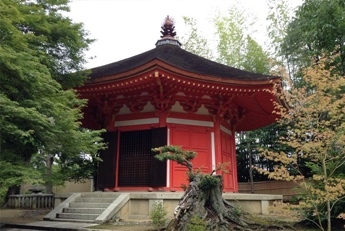 Established in the year 859, the shrine is famous for gods that ward off evil and grant good fortune. It is also known for the enshrined god of married couples who promotes a good match and matrimonial harmony. 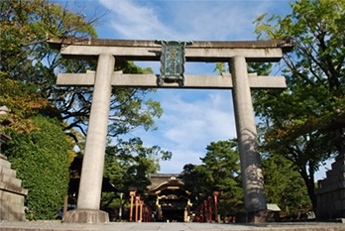 Within the grounds of the shrine is a place where gods from across the nation congregate, where it is said, that if you visit there, the same benefits are gained as if you had visited all the god’s shrines separately. In addition to this, various other gods such as the god of food and the god of confectionery also have shrines dedicated to them. Yoshida-jinja Shrine is also famous for the Setsubun Festival (bean throwing festival to ward off evil). On an average year the shrine bustles with around 500, 000 people who come to worship, visit stalls and pray to drive out evil. This temple, which is situated at the foot of Higashiyama Ryozen, was opened in the year 1606 by Kitano Mandokoro-nene (who after entering the priesthood changed her name to Sister Kōdai-in Kogetsu) in order to pray for Toyotomi Hideyoshi’s happiness in the next life, after he died. 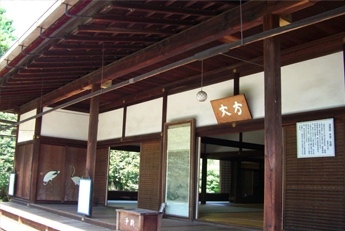 The memorial hall, mausoleum, kasatei tea house, Shiguretei tea house, entrance gate and moon-viewing room have all been designated as important cultural properties. 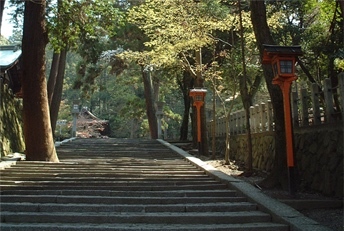 Hideyoshi and Kitano Mandokoro-nene have been deified in the Otamaya (mausoleum) and their resting place lies below a statue of Kitano Mandokoro-nene. 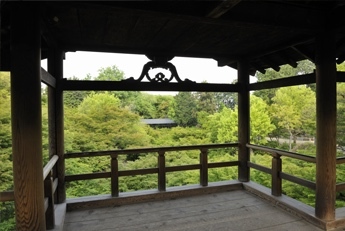 Additionally, the garden created by Kobori Enshuu which extends out from the centre, is illuminated in spring, summer and autumn and is recognised as a historical landmark of scenic beauty. 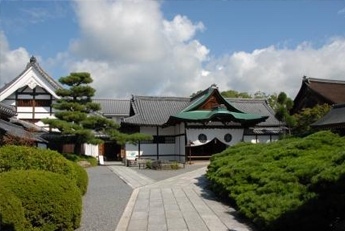 The Saga-in Imperial Palace, which was a royal villa originally built as a new house after Emperor Saga married Empress Danrin, was changed into a temple and renamed “Daikaku-ji Temple” in the year 876. 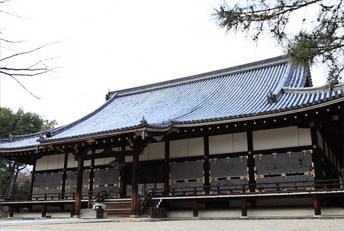 Until the beginning of the Meiji period it was also known as Saga-gosyo (Old imperial palace of Saga) due to the fact that it was a Monseki temple with high social status where generations of Emperors and royals served as Monseki (chief Buddhist priests of royal blood). It is known as the original temple where the Heart Sutras were practiced and where the Hanyashingyo (Heart Sutras), which were written by Emperor Saga, are enshrined. 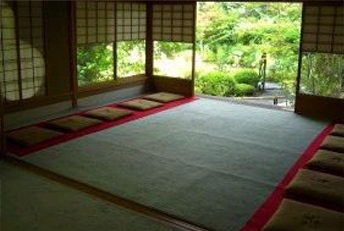 It is also where the Hana-no-tera (temple of flowers) is situated where the Saga-goryu style of ikebana originated. In addition to this, the temple is famous for the Harvest Moon festival where, around the 8th month of the lunar calendar, a Moon viewing evening is held. Michiie (Kujō) Fujiwara, who was a regent at the time, took the 「東」(tō - east) and「福」(fuku – good fortune) symbols from Nara’s Tōdai-ji and Kōfuku-ji respectively and devoted 19 years from 1236 to 1255 to the temple’s completion. 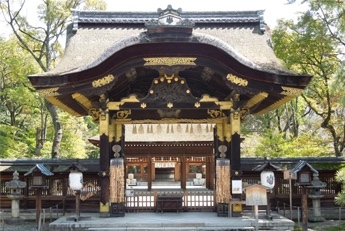 Even though the temple was destroyed due to frequent fires, these important architectural structures that allow us to better understand the lives of the Zen priests of the Muromachi period, rebuilt one by one, including the Sanmon gate (national treasure), are largely still standing today. 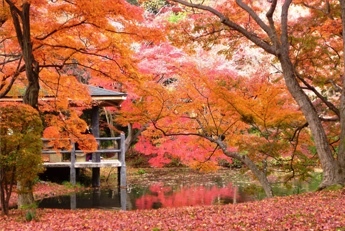 The Tsuutenkyo bridge, famous for the view of the autumn leaves and the dry landscape garden, built next to the Hojo (a Zen temple where the Buddhist priests lived) within the grounds of the temple are well known. 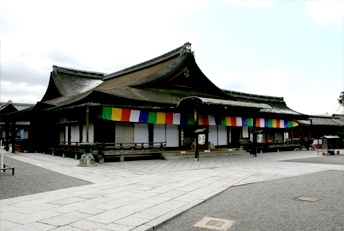 Emperor Uda established the temple in the year 888 and because he was the first monseki (head preist who was also a royal) the temple became known as the Omuro Imperial Palace. 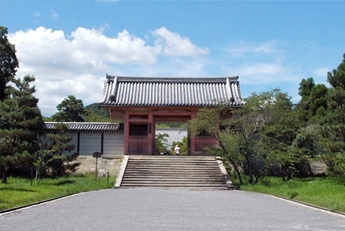 Within the grounds of the temple is the main hall, a national treasure, which was dismantled and reconstructed in the current location by the Old Imperial Hall of Ceremonies, the vermillion central gate, the five-storey pavilion, a temple dedicated to Kannon (all important pieces of cultural property) and more. 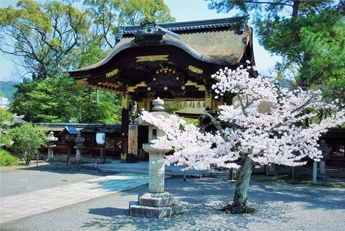 Ninan-ji Temple is also known for the shorter, late blooming cherry blossoms called Omuro Cherries (object of scenic beauty). 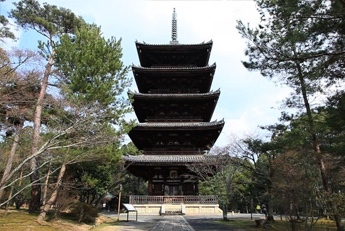 The temple appears in classic literature a number of times in particular, the famous story “The Preists on Ninna-ji Temple” in the book “Tsurezuregusa” (Essays in Idleness). 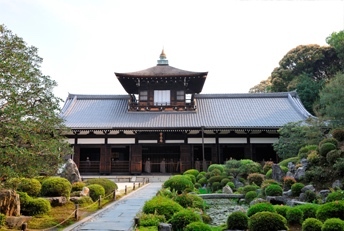 In December, 1994 the temple was enlisted as a Unesco World Heritage site as one of the places of cultural significance of the old capital Kyoto. Myoshin-ji Temple, in the west of Kyoto, has over 40 tacchu sub-temples (temples within the grounds of a temple). 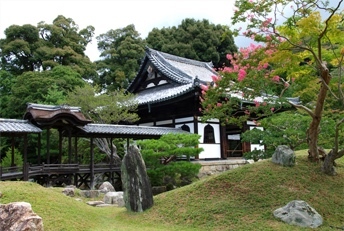 Taizo-in sub-temple was built in the year 1404 and is known as the most outstanding ancient temple within the grounds. 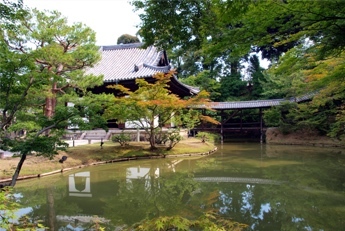 Within the grounds, there are many highlights including national treasures: “Hyonenzu”or “Catching a Catfish with a Gourd” an ink painting by Josetsu (copy of original work), “Motonobu-no-niwa”, a historic dry landscape garden, thought to be the work of Kano Motonobu, and the beautiful scenery of the strolling garden (Yokou-en garden) where flowers bloom each season. Actually called Kyoougokokuji, in the times of ancient Kyoto the miyako no minami Genkan (Southern Entrance to the capital), the Rajomon (main city gate) were built to the east. Following this, the great Buddhist monk Kuukai was asked to complete the temple and the first Esoteric Buddhist temple in Japan was created. 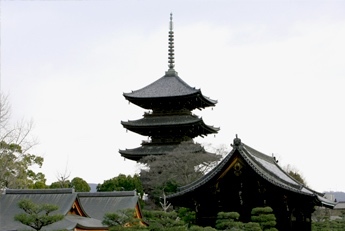 The five-storey pagoda, a national treasure, within the grounds of the temple is the tallest in Japan at 55 metres high. Other places worthy of note are the lecture hall (place of cultural significance), which is home to the oldest collection of Esoteric Buddhist carvings in existence and the main hall and daishido-hall, which are both national treasures. 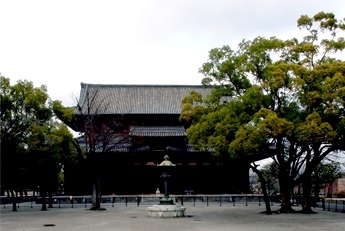 In December 1994 Tō-ji Temple was named World Cultural Heritage as a cultural asset of old Kyoto. We are unable to photograph in the Mieido area. 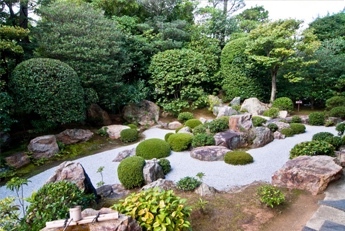 A renovated old Kyoto townhouse and garden. 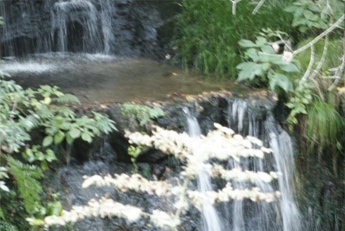 The garden was designed by renowned gardener Jihei Ogawa, 11th generation of the Ogawa family. The machiya townhouse was renovated by Hiroyuki Wakabayashi, a famous architect in Kyoto. Many secrets to happiness seem to be hidden in the house. 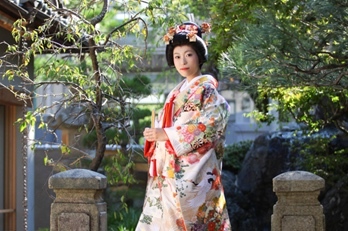 Discover them while enjoying a wedding photo shoot! The facility may be rented for private use. 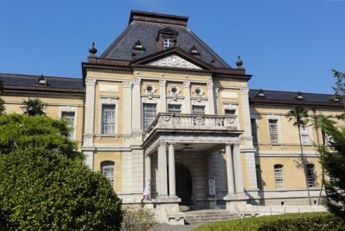 This brick building was completed in 1904 and is an antiquity that is still in use today in Japan as a Government Office Building for official business and conferences. The façade is still preserved in the same manner as when it was originally built, and in 2004, was appointed as important cultural property. The Renaissance style exterior focuses on the roof which is one level higher than the face of the building and the symmetry projected on both sides. The building brings to mind the contemporary western-style mansions with an interior that has been created through skilfully adopting Japanese-style engineering. 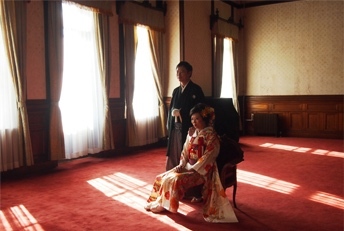 The reception hall on the 2nd floor is a highly formal room which is an exemplification of main halls of the past. It was used for official functions and for the reception of important guest and in the present, is a hireable venue that is used for festivities and wedding ceremonies. Between July, 2014 and February, 2015 (estimated) the reception hall will not be able to be used due to air conditioning renovations. 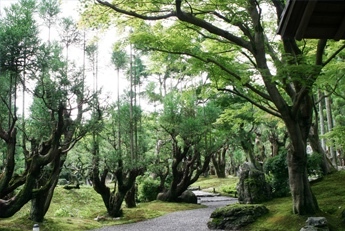 Opened in 1924, this is Japan’s oldest comprehensive botanical garden. 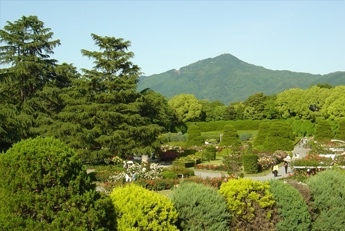 Situated on a plateau in the north of Kyoto city the gardens are a place of scenic beauty with a view of Mt Hiei and Mt Higashiyama in the east, in the west: the clear stream of Kamo and in the north: the peak of Mt Kitayama. In the spring, the Mountain and Yoshino cherry and other Satozakura (varieties descended from the Oshima Cherry) are in full bloom. In autumn, the coloured leaves of the Japanese Maple, the American sweet-gum and other tree varieties are an incredible sight. 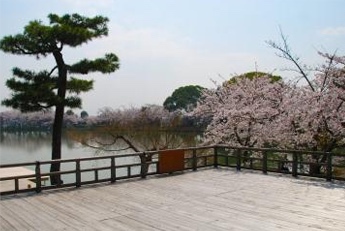 Besides the row of Camphor trees that stretches 200m, in summer and winter there are also beautiful new green foliage and an abundance of flowering plants to be enjoyed. 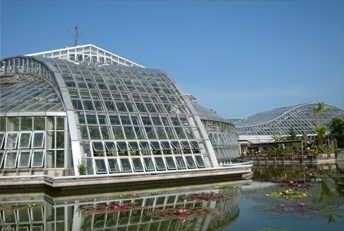 In addition to a European-style garden that consists of a sunken garden with a bed of roses, fountain and waterfall, the Botanical Gardens also includes a conservatory complex which is one of the largest in Japan in regards to plant varieties with an immense scope that includes tropical plants such as the Welwitschia and the Boab tree and a day-to-night room where you are able to see the night blooming Queen of the night cactus during the day. 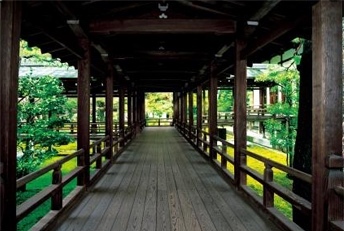 Borrowing the backdrop of three mountains in Takagamine is the magnificent Shozan Resort Kyoto. A small stone path, wind that rustles the bamboo, the refreshing sounds of the stream, maple leaves and a grove of plum trees. Come to a site over 150 000 square meters in size where the beauty of nature across the four seasons is sealed into one package. Pass the time in comfort liberated from the noise of everyday life. 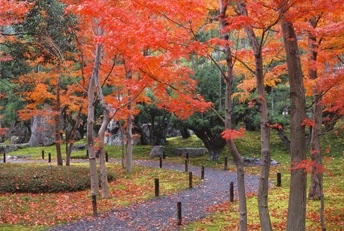 A Kyoto resort, wrapped in the beauty of the four seasons, where you can enjoy Japan.